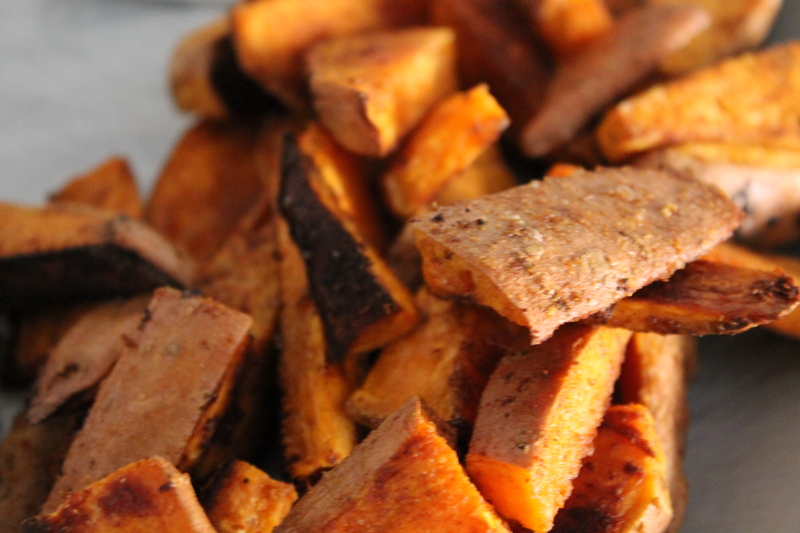 Second you mix the yam wedges with your spices, the salt, and olive oil. Now I fudged all the quantities and so did my roommate so just add what seems appropriate. If you really have no idea just make sure that you can see a little of it sticking to the yam once it’s all mixed but don’t go heavy on the salt (you can always salt later if you need to!) I made that mistake with my turnip fries and . . . . well, they were irreversibly salty. third you put all the spiced and oiled wedges onto a cookie pan in a single layer. 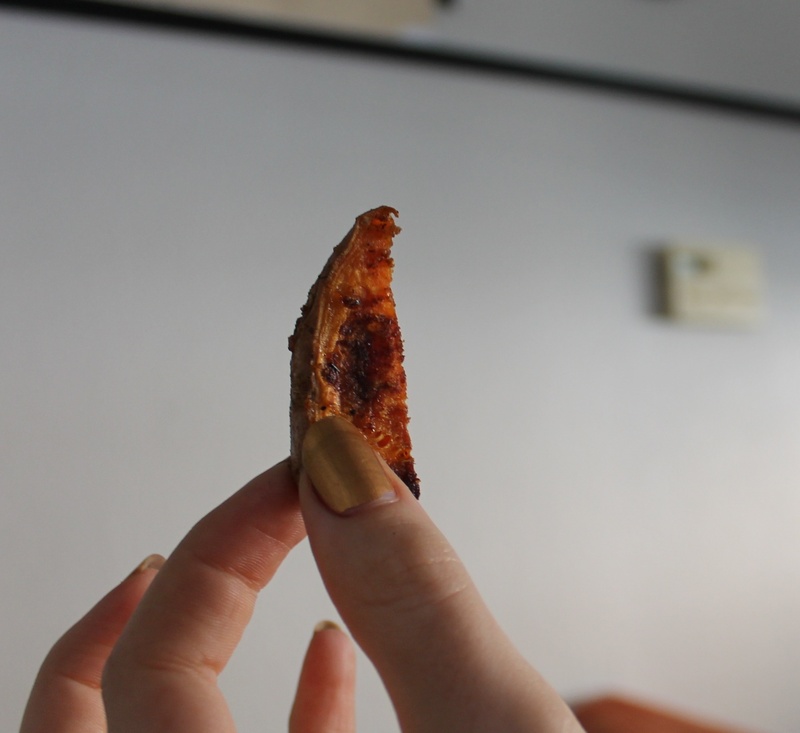 you don’t want your wedges floating in oil, so don’t pour it all in if you’ve got a lot. stick it in the hot over for 15 minutes then flip them over. They should be browned pretty decent-like on one side. Cook for another 10 minutes and bada bing bada boom! There you go! 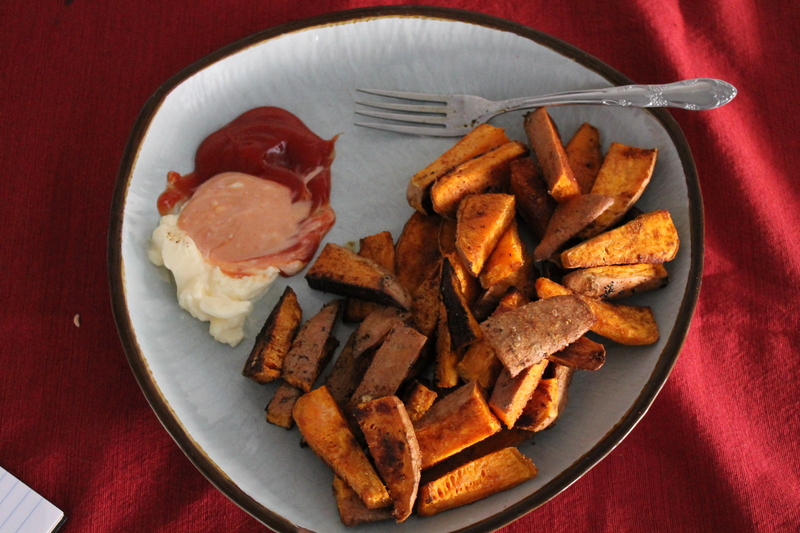 sweet potato fries! Now I enjoy eating mine in a ketchup mustard mix but I’m sure whatever you put on normal fries will work great on these too. After I made this my roommate was rather thrilled with the idea and made batch after batch day after day until she was tired of them. (I haven’t seen a yam since). The boys upstairs obtained yams too . . . except theirs got defenestrated. If you’ve ever made potato cakes, this is basically the same thing, except with yams! You can go either sweet or salty, but I did sweet. – boil them with a little salt for around 20 minutes or until mashable and soft to the fork prod. if you wanted to you could stop at this point and just eat mashed yam, but maybe I’ll do that some other time. -add the egg into the mashed yams and bat them together. -spoon a dollop onto a hot greased pan and wait until the bottom has cooked. Once you’re able (it should only take a minutes) flip the cake over and use the spatula to push down the cooked side flat. once the other side is cooked I usually flip mine back over again to finish up the first side and brown the edges that I squished out. I enjoyed eating mine like British shrove pancakes: with lemon juice and sugar, but honey works just as well. for that matter a creme cheese icing would be fantastic as well. the freeze decently well, but are definitely best fresh. if you plan to freeze them make sure your batter’s a littler thinner since you’ll want the toaster to make them warm and a little firm without turning the edges black.